Replete with every possible tropical charm that any traveler to Bali would want to encounter, the Abakoi Villa is the destination supreme, for a discerning holiday maker who wants to enjoy as much as the traditional hospitality as he wants to absorb the beauty and the splendor of this region known for mesmerizing sunsets, unequalled natural beauty and trendy modern city features as well. 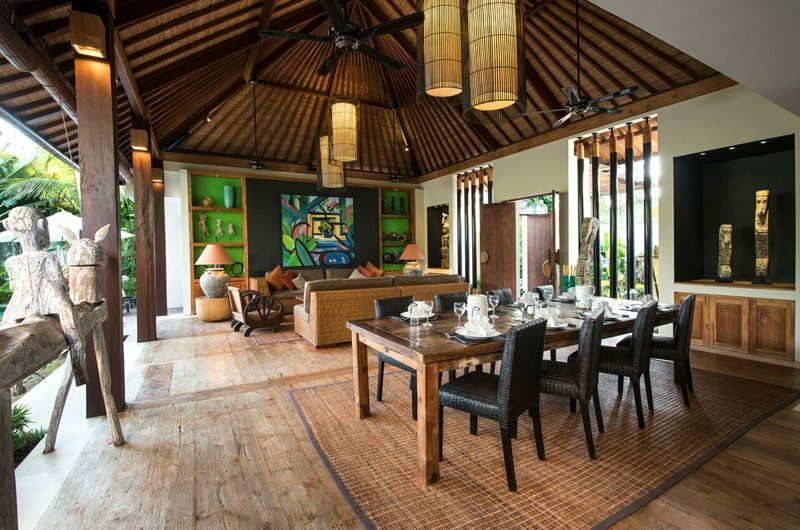 Set in The quiet neighborhood of Seminyak in the Drupadi neighborhood, this is that one address most envied in Bali. 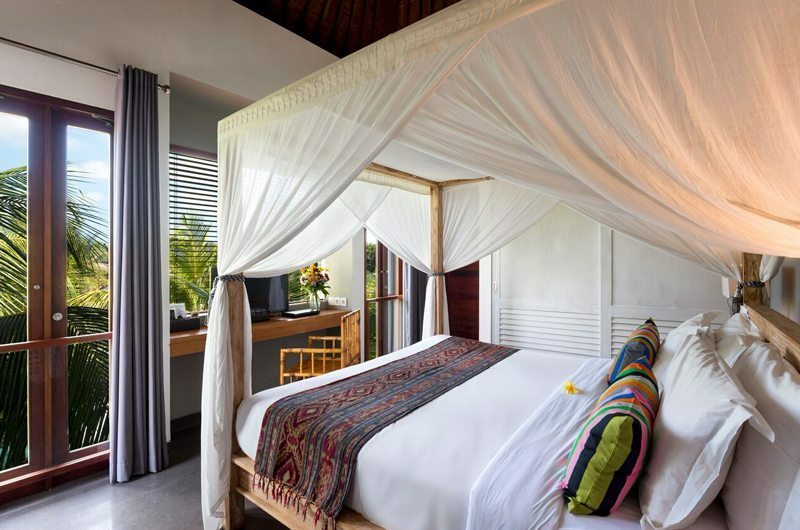 The villa with six gorgeously designed bedrooms has one master bedroom with a king sized bed, while three have Queen sized ones and one with a twin bed arrangement and one with bunk bed for 4. Rooms are fully air-conditioned and have ensuite toilet and showers. The master bedroom’s ensuite bathroom comes with bathtub. 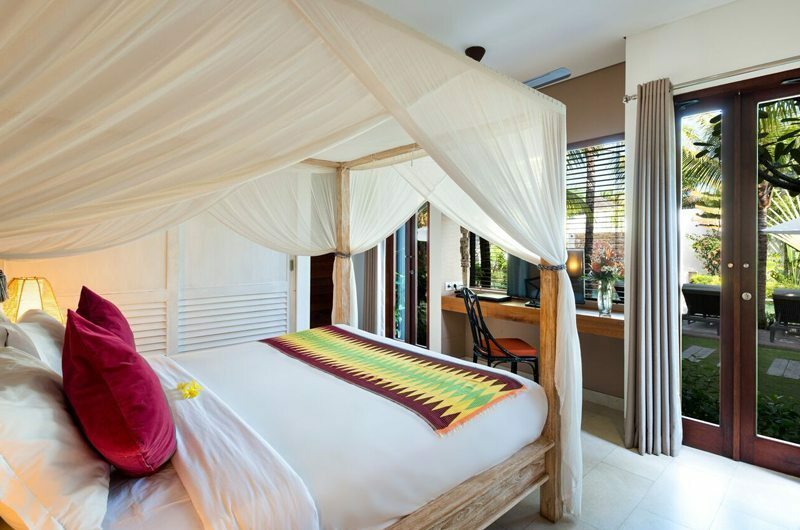 Each room is a treat to the eyes with soothing soft pastel shades setting off the dramatic colors of the art work on the walls or the local crafted pieces of art so reflective of Balinese life and culture. Each room opens out to some form of greenery. The master bedroom comes with walk in closet, mini bar, and many other features that spell supreme comfort. Next to the ground floor accommodation is the double storied unit that houses the four other bedrooms-tow on the first floor that open out to balconies and two on the ground that have the lush green sights outside the large French windows. The rattan sofas, ethnic wooden chairs, the soft muted lighting bringing out the beauty of the artifacts and the spaciousness of the living and dining in it makes it a complete pleasure. The area opens out to the lawns and the greenery beyond as will be the place to relax after a day of hectic sightseeing. The long antique finish dining table with its wrought iron chairs and the wide glass doors makes the living area so outdoorsy that one instantly welcomes the light and beauty of the outdoors. The kitchen has all the necessary cooking equipment and a freezer for you to keep any food items you wish to cook for the family. Of course the highlight of the villa Abakoi is the pool and its resplendent garden, but also the manner in which the layout has been planned, the grand entry into the living room is through the lush gardens walking as one does down the paved stone pathway. The pool is sparkling clean maintained by the attendants at all times. The mornings would be great of spend meditating out in the lawns or swimming laps in the 16×4 m large pool. The eight deck beds are lined up by the sides while the gazebo with its comfortable sofa is another space worth relaxing in. The gardens with its verdant greens are so inviting with their foliage of fragrant plants and trees. Just about 600 m away from the beach, the area of Drupadi street while tucked into the quietest areas for your comfort is just a stone’s throw away from all kinds of touristy attractions like gourmet restaurants, chic boutiques and biking or sunsets at the beach, discotheques and the likes. For those who are culturally inclined there is ample opportunity to explore so many relics and rural centers wound Seminyak with easy mode of transportation that can be rented from the villa itself. The villa manager maintains the overall features of the villa and coordinates the efforts of the staff including the maids, the gardeners, the concierge and the butler. You could in fact ask for a chef on a special request though the villa offers you breakfast as part of the arrangements. The staff remains highly discrete in its conduct while ensuring that you get services at all times without losing out on your privacy. The villa of course does hold a capacity to extend the numbers accommodated to up to 12 and can thus play host to a large extended family on vacation and also be the venue for a holiday with colleagues or friends on a reunion trip as each room and space has been designed to give each other adequate privacy and comfort. Need a family friendly villa in Seminyak? 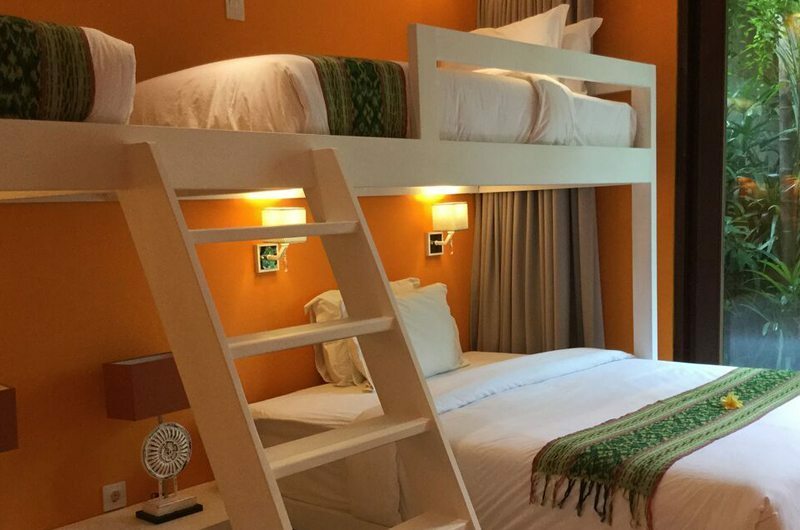 This villa has a great bunk bedroom which sleeps 4 kids and 5 other rooms that are pretty much equal in size so no arguing on who gets the biggest one. The villa comes with a chef, butlers, housekeeping and security around the clock.